So, You're a Writer...: The Audiobook Process + Narrator Interview! The Audiobook Process + Narrator Interview! ► Last October, my cousin asked if STRENGTH (Mark of Nexus #1) was available as an audiobook. She'd had two brain surgeries, and it was difficult for her to concentrate on reading. Unfortunately, neither of my titles were available in audio format at the time, so I promised to look into it. ► After shooting a few e-mails back and forth with ACX, I ended up posting STRENGTH (Mark of Nexus #1) and COURAGE (Mark of Nexus #2) with pretty extensive marketing stats. Then, being the control freak Type A personality that I am, I spent hours poring over narrator samples, taking notes, and contacting a select few with invitations to audition. ► Things kicked into high gear from there. We set up a schedule, and before I knew it, she had the first fifteen minutes ready for me to review. I spun around in my chair carefully listened to the clip and provided feedback before approving it. Then it was game on. ► Over the next month and a half, we communicated back and forth while she worked. I had a chance to listen again and approve the whole thing at the end--and then it was done. Boom. 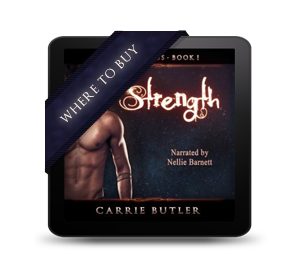 A week or so later, STRENGTH was available in audiobook format! How cool is that? 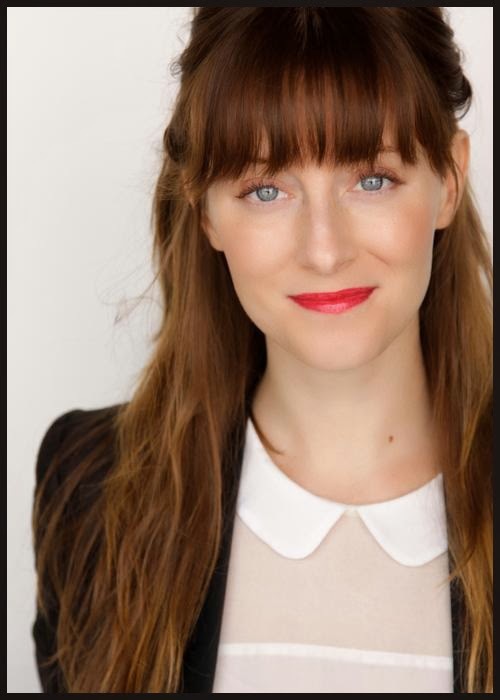 American actress, voice-over “artist”, and producer Nellie Barnett lives and works in Los Angeles, where she perpetuates stereotypes by driving a Prius, rescuing small chorkies, and sometimes teaching yoga. Luckily she's a meat-eater, which helps, as well as a decent ukulele player and mediocre drummer. She is currently learning to drive stick shift. Carrie Butler (CB): Hey, Nellie! Thank you so much for taking the time to sit down and chat with us. I know plenty of my fellow writers are curious about the audiobook process—especially now that Amazon has made the format more accessible. Could you tell us a little bit about how you got into narration? Do you do other types of acting, too? Nellie Barnett (NB): Hi Carrie! Hi Carrie’s wonderful readers! I’m so happy to be here. Well gosh. The internet, or the more fancy name “new media”, is a bit of the wild west these days. And I’m lucky enough to be a wayward cowgirl of sorts. I work as an actress, voiceover “artist”, and producer in Los Angeles, and much of my work is in the digital space. I love dreaming. I love storytelling. I love people and their strange worlds and experiences. And so I try to just translate that for an audience, regardless of the medium. We’re all a little weird and funky, and I like to contribute to owning up to that. I think it brings us together and makes us a little less afraid of life and each other. I mean…if we’re gonna get DEEP about it. CB: That IS deep! I kind of want to crawl under my desk and contemplate the meaning of life now. But don't worry, I'll finish the interview first. ;) What other acting work have you done that you can tell us about? NB: Oh man I’ve really done it all. Lots of little indie films, the obligatory “Criminal Minds” TV episode, LOTS of web-series, LOTS of national commercials and stuff. LOTS of weird and wonderful voiceover work. And an overwhelming stream of endless auditions. If you’re at work or home sick today and your cable is down, here is the greatest, most hilarious web-series I’m in that no one has ever seen (called “Settling”) and here is a web-series I’m in that’s also just amazing (called “Patrick & Molly”). I’m super proud of these projects. They’re so unique and funny and irreverent. And that’s what the internet is for, right? Also, I’m the oreo cookie in this TV commercial. Nope. Not just the voice. I literally spent 13 hours in a full body oreo cookie suit custom made for me and couldn’t use a bathroom. I’m VERY talented, ya’ll. CB: I love that commercial so much. I just... yeah, I'm pretty sure I'm going to show that to everyone I meet for the next three months. "THIS IS MY NARRATOR!" Ahem. Sorry. Serious interview mode. What is the book narration/production process like for you? NB: It can work a couple of ways. Sometimes an author or publisher will approach me or sometimes I’ll send an author/ publisher an audition. They’ll make me an offer, and I’ll get crackin’. It usually takes 2 months to finish a book, so it can be a long and involved process. But mostly, I just get to read and perform cool stories. I often pinch myself that I get to work with talented writers, build relationships with them, and help them bring their characters to life. There’s nothing cooler than when an author hears his/her character’s voice for the first time and gets sort of emotional about it. It’s a super cool experience. CB: You should've seen my face the first time I heard you do Rena's voice. I'd just listened to a half dozen or so other auditions and taken notes, so I was in a bit of a daze. But then yours started, and I was like, "THAT'S HER!" Anyhoo, what is your work environment like? Do you have a studio? NB: I do! When I first started, I was lucky enough to have access to a sound room at my producing partner’s studio. But frankly, the nature of the work is such that often I only have to pop into the studio and make a tweak here or there. So it made sense to have a space at home. My fiancé and I bought a fixer upper house in South Central Los Angeles (gulp!) last year and renovated it into the greatest space ever. I have a VERY handy future husband. He can pretty much do it all. SO THEN I bought a vintage 1960s trailer from this amazing nomadic photographer who happened to be passing through LA, and my fiancé and I converted it into a proper sound studio in our backyard. The sound is pretty damn incredible and the environment clearly unique and inspiring. So I pretty much do yoga from 6:30-8 am every morning, then take my coffee to the trailer studio and get to work. Don’t mind me. Just pretty much living the hipster dream over here, you guys. CB: That sounds so cool! You'll have to give your adoring fans (us) a photo tour sometime. ;) Do you have any tips for writers when it comes to working with a narrator? NB: Hmmm. I guess, just get to know the person on the other end of the voice because you’ll be spending a great deal of time emailing each other and communicating. It helps to recognize that narration is in many ways a performance, so you (the author) can’t really control the exact outcome. And that’s a good thing. The collaboration of your words and the narrator’s interpretation is what makes it a whole new art form and a separate product completely. We’re so lucky to do the creative work that we do, and we’re blessed to work together. So enjoy the process and have fun. You deserve it. CB: Well said! We are, indeed, blessed to work together. :) Thanks for stopping by, Nellie! Question of the Week: Do you listen to audiobooks? Three winners will be chosen on March 10, 2014, and each one will receive a code to download STRENGTH (Mark of Nexus #1) from Audible.com. This code is not valid for other titles, and it cannot be redeemed for its equivalent in cash. International entries are welcome. If you win, it would be really, really nice of you to review. Thanks! That's great you found someone who was perfect for the audio. That she was an Oreo cookie is a bonus! I do not listen to audio books as a general rule. Congratulations on making this happen, and thanks for the interesting interview! this is so impression. I love audio books for long trips and the fact that you are as determined as ... I'm not sure. I'm just so proud. I love Nellie's voice. This is going to rock the reading world. Strength in audio form! Very cool! I really want to look into this. Thanks for posting this great interview and I'm glad you found your Rena! So cool. And I think she sounds great. Loved this peek into the audiobook process. What a great interview! Love it! Nice to meet you, Nellie. Congrats on getting Strength as an audio book. I'm sure your narrator is great. Thanks, David! I agree. It's kind of a win, win. Isn't she?! :D Thank thee, Goddess of Grammar! Nellie is awesome! I remember reading that part in the book, and she sounds just like what I had going on in my head! Isn't she? :D Thanks, Elizabeth! The process from the author and voice over artist perspectives is very intriguing to read about. Getting them both in this same post really helps and lends more to understanding both sides of the audiobook tale. Score! I can't wait to hear yours. :D Thanks, Jamie! Interesting interview. I have been curious about people who can do audio versions of books. I can't believe they never stumble. I read lots of audio books while I walk. I love it. Good luck with yours, Carrie. Well done for getting your books made into audiobooks! Super cool! I REALLY want to do audiobooks, but from the UK, I'm not sure it's so easy. When I looked into it before, all the places I checked were only available to residents of the US, which I found rather weird lol. I can see why you like Nellie's voice. Great little audio clip! And it sounds like you had fun in the process. lol wow. Perception failed me. Nice. She has a strong voice! Their site says this on the matter: "We hope to open up to a wider global audience in the future." Hopefully that means it will be open to the UK soon! And isn't Nellie great? She's doing so many interesting things! I just listened to the audiobook for Courage and loved the reader! Nellie did a fabulous job and she even did accents.